hammock, originally uploaded by la bête. This weekend was the first outing of my hammock and I was very, very impressed. It was a little tricky to find a decent spot, meaning I was right at the edge of the campsite and the first night was a bit chilly. The main problem was where my sleeping bag got compressed under me and lost it's insulation. On the second and third nights I used my thermarest and that worked better. Reading around the net, it appears that a number of people have had success with reflective mats such as car sun visors and I plan to give this a try next time. It did stand up very well under the rain and wind though - much better than my tent. 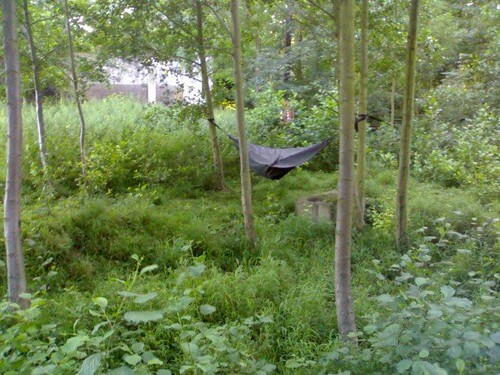 Where the hammock really came into it's own was in comfort. Normally the second and third nights under canvas have me with a stiff back and a sore hip from lying on my side. The hammock was more comfortable than my bed at home.